The SR3A kit is only that little daughter board, Highlighted in the photo and mounted onto, the larger CL3 Board. 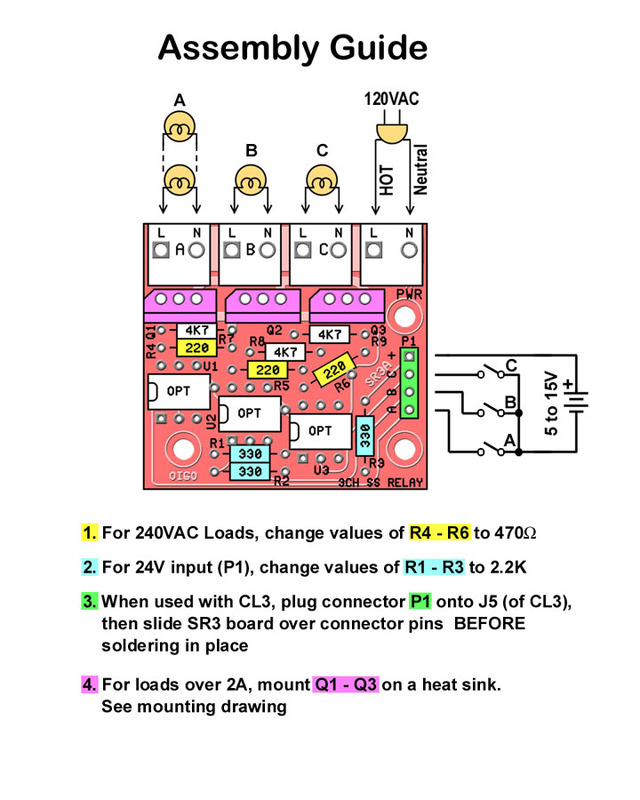 The CL3 board is NOT INCLUDED in this kit, and must be purchased separately ! When I released my first color organ kit (CO3), there were many request to wire it directly to the sound source. This original kit connects directly to the AC line, and any attempt for direct connection can make a fire and shock hazard. To avoid this, that kit gets its sound thru a microphone. If wired as instructed, and placed in an enclosure, prior to use, it will be perfectly safe. The newer color organ (CL3), was designed to run off of low voltage. Typically 12VDC, or 9VAC. If used by itself, it can drive LEDs, and in particular 12V LED strips. This makes it perfect for automotive installations. But when used with a 9VAC power source (and “jumpered” correctly), it syncs with AC line. This allows it to modulate the brightness of TRIACs, just like the original CO3 kit. By “piggy-backing” this solid state relay board, onto the color organ board, we now have a color organ, that can drive 120VAC lamps, but can safely be hooked up directly to a sound source, such as a stereo, or MP3 player. This SR3A, 3-channel solid state relay board, electrically isolates the control signal (coming into P1), and control its 3 TRIAC outputs. In addition to being a plug-in to the color organ kit, it can also be used as a general purpose solid state relay. With a few cautions. 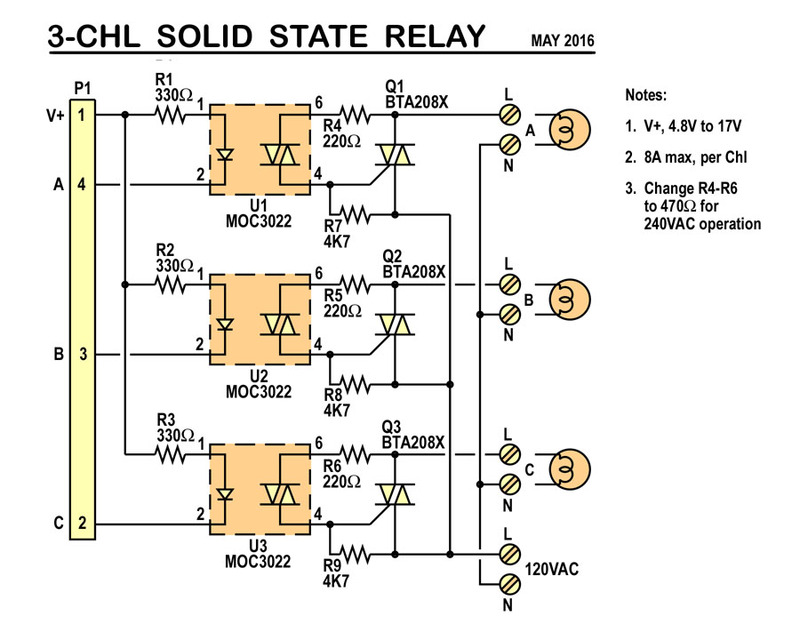 Most solid state relay outputs are “switch contacts”. That means they are a circuit element, where the load, power source, and “switch” (the solid state relay output), are hooked up in series, externally. Here, there are three terminal pairs that hook up directly to the load, and a 4th pair that hooks up to the power source. It must be an AC power source, as the output switches are TRIACs. The input, can be any voltage in the range of 5V to 15V, with the parts provided. That means TTL compatible 5V logic can be used. Even though the CL3 kit uses low voltage, this solid state relay, on its output side, is intended to be used with AC line voltage. Either 120VAC (with parts provided), or 240VAC (with a few part changes). The circuit is very simple and basic. It is based on Opto-isolated TRIACs. Here, the Motorola MOC3022 is used. The input is an IR LED, that shines its light onto a photo sensitive TRIAC. This all happens inside a small 6-pin plastic DIP package, so no ambient light effects operation. The LED input needs at least 10mA of current flowing thru it, to insure, that the TRIAC is turned ON. 330 ohm resistors have been selected so this will happen with voltages as low as 4.8V. Also 15V is the recommended max voltage, because above this point more than the maximum 50mA will flow thru, and possibly destroy the internal LED. The TRIAC output can switch as much as 1A. To drive a load larger than 1A, the isolator output TRIAC, in turn, swiches ON, a larger TRIAC. In this case, a BTA208X. This larger TRIAC actually drives the load, and can pass as much as 8 amps, and withstand line voltages, upto 600V. The terminal blocks designators, J1-J4, are absent from the silkscreen, but are located just above the TRIACs. Orient such that the wire entry holes open to the top edge of the board. Wire as shown in the drawing, above. Note options for 240VAC loads, and/or 24VDC input. 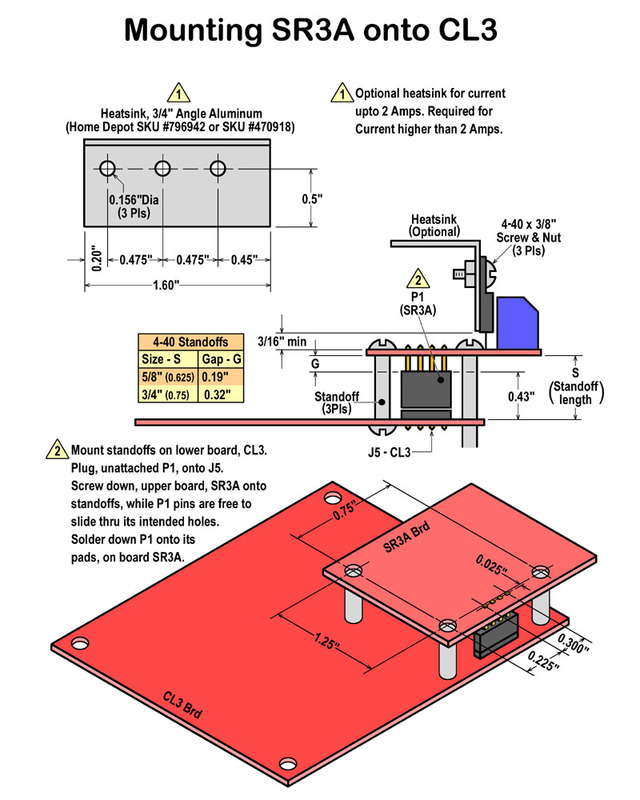 Included in the drawing, are the dimensions of an optional heatsink. No insulator kits are needed, as the TRIACs provided have insulated tabs.